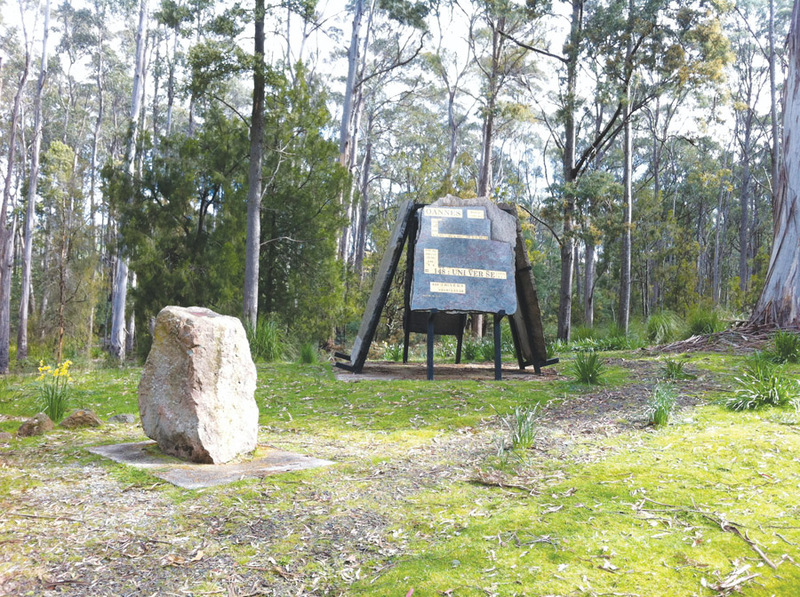 Earlier this year  a New Dawn reader came across a mysterious set of strange monuments in a rural recreation area called Sanctuary Park, situated in Railton, Tasmania – just 20km south of the city of Devonport. What he found was a set-up of four horizontal stone plates. Inscribed on them are writings, grids and mathematical equations – the kind that you can tell aren’t taught in school. These plates have puzzled the locals, as it turns out, ever since they were placed there, one by one, between 2002 and 2003. And these are just the newest additions. In September 1990, another enigmatic upside down pyramid shaped object with attached plates was erected. A slab of concrete keeps the whole thing off the grass and atop it sits a black rectangular prism. Four shafts extend from the prism to support an upside-down pyramid. To the left and right of this rectangular prism are two plates with inscribed mathematics – apparently dealing with the design and purpose of ancient Egyptian pyramids. Under the upside down pyramid is this eulogy – Norman Sykes: 1896–1981. Sanctuary Park is 40 acres in size, and was donated by Mr Norman Sykes to the town of Railton to be used as a sanctuary for the local wildlife. Norman was World War One fighter pilot and engineer who, after the war, moved to Railton with his wife and two children. Norman lived in a shack on the sanctuary land. 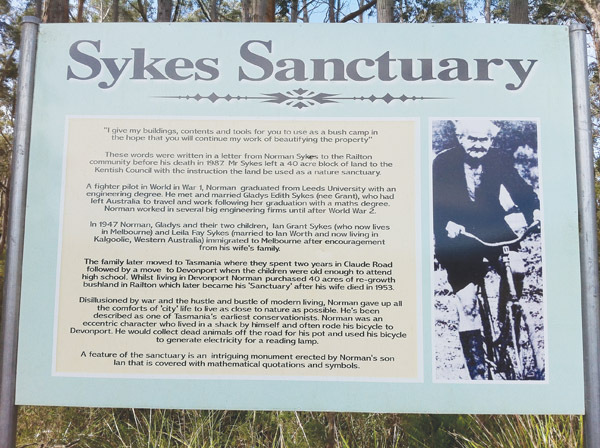 Sykes was known locally for his eccentric ‘bushman’ lifestyle, and is described as one of Tasmania’s earliest conservationists. At Sanctuary Park a sign shows an old newspaper photo of Norman, his wife and son riding in his home-made, completely pollution-free, built-from-scrap pedal car. Norman remained a local activist all his life who wrote letters to the editor of newspapers explaining his ‘eccentric’ ideas that today might be regarded as far-sighted. A sign at the entry to Sanctuary Park, Railton, Tasmania. It contains a short history (and photo) of the man who donated the land for the sanctuary, Mr Norman Sykes. A brochure made by students from a local primary school identifies the builder of the mysterious monuments to be Ian Sykes, Norman’s son. The pyramid and its underlying slabs reference a variety of ‘ancient wisdom’ figures (see below for photo of this structure). The architect of these monuments clearly went about his complicated mathematical business by building upon information from the past (these images and descriptions are available in the magazine). The most important of these figures is Oannes, an ancient Sumerian ‘god’ credited with the invention of writing (his name appears a few times on the monuments). Oannes supposedly taught humans how to create symbols – the idea that some thing can be used to represent another thing. This concept is important to understand because the purpose of these monuments – as we will learn – is to analyse the nature of symbols, or more specifically words. The monuments are unlocking a code to the real hidden meaning of words and letters. The theory advanced here is that every word, phrase and audible sound runs off a hidden numerical source/matrix. All the mathematical equations at Sanctuary Park are designed to prove this theory. One of the first mysteries I resolved in my investigation of this site is that Norman Sykes did not create the monuments. In fact, Norman apparently had nothing to do with the monuments or their theories at all. This I learn from speaking to Norman’s son, Ian. Ian made it clear he’s still working on the very same project he began the moment he retired decades ago – the enumeration of our language. The Sanctuary Park monuments were created and erected by Ian. Since then his work has advanced even further. He devotes 4-5 hours a day, basically ‘decoding’ words in our English dictionary, finding in these words (plus their meanings) numbers and patterns that connect the words and meanings to each other – a hidden code. Section of Sanctuary Park, Railton, Tasmania. Between 2002 & 2003, Ian Sykes erected these four massive stone plates etched with a range of enigmatic inscriptions. What Ian has uncovered is more-or-less a mathematical blueprint that underlines our entire language. This blueprint maps out and defines, in single fact-form, how every single word/symbol specifically relates to one another. It is a number-based dictionary system that has not changed since it was supposedly introduced by Oannes. Below are good examples of Ian’s system in action, and he promises these examples will make people “scratch their heads in wonder.” But first, it is necessary to explain some of the complex (yet coherent) methods/theory used by Ian to build this numerical system. Ian’s work is so mind-boggingly complex that it cannot be explained it in its entirety, so my aim here is to communicate Ian’s central premises. It is crucial to understand that Ian doesn’t decode words in their written textual form. He doesn’t look at the letters and how they behave/interact specifically on the page. Rather, Ian analyses the sounds of words. Our language is sound. Letters and words on a page are simply the codes for making certain sounds, whether to be read aloud or thought out in our minds. On a page, letters express different sounds depending on context. The letter “C,” for example, is used to make a whole range of sounds, e.g. car, chicken and cereal. Some letters are silent, forming and indicating no sound at all. To avoid confusion and inconsistency, Ian’s approach to analysing and decoding language is through breaking words down into sound bites. If Ian wishes to decode the word “SAVE,” he will set it out as “S/AY/V.” Or, the word “CHINESE” as “CH/AY N/ IES.” By doing this, Ian can properly examine our language so it can be analysed consistently through sounds. Ian says there around 150 sounds (or what I call “sound bites”) that make up our language. Each syllable/sound bite has an inherent number (which can be a ‘positive’ or ‘negative’ number). See below. Each number is tied to a respective sound bite. “Sh” always yields the number 9, “ell” will always be number 4, “ter” is the negative number -2, and so on. The sound bites are the physical vibrations of certain laws rediscovered by Ian. How did he do this? When crunching individual numbers for individual sound bites, Ian used trial-and-error. He crosschecks a new word with other words and meanings that he’s uncovered previously, finding patterns, consistency, etc. He tells me the process of decoding a word or two takes a full day or more. Ian has rules which help him anchor this otherwise chaotic-seeming work. These derive from ancient knowledge. Two significant texts are the ancient Chinese I Ching and the somewhat less-known ancient “Oannesian” Sumerian artefact known as WB444 of the Weld Blundell collection, Oxford University Expedition (1928). Ian says these texts contain the founding principles of his work. The upside down pyramid monument on the same site. It acknowledges a range of notable figures from humanity’s ancient past. It also contains two marble etched plates outlining numerical and word codes of an original language and the Great Pyramid. The first two numbers in WB444 are 28,800 and 36,000. They appear in other sections of the timeline and add to form the number 64,800. Ian says the numbers here are not intended to simply be read as years. On one of the explanatory panels in Sanctuary Park, Ian claims that on monument WB444, “Oannes, the inventor of writing, set out the values of words [and… numbers] of the three common elements in the DNA and RNA viruses.” Here Ian appears to refer to the concept of language as a virus in the same way that a biological agent reproduces inside the cells of living hosts. Oannes allegedly set the original ‘rules’ of the code that manifested into language. The I Ching is also important in Ian’s system and is recognised on one of the monuments at Sanctuary Park. It defines the concept of Yin/Yang, or the idea that from one half of a thing you can see what is needed to make that half whole. Words are connected to each other through meaning. From one word, another can arise. This is not unlike pulling a new meaning from one word by using a thesaurus. These two words are connected in a mathematical Yin/Yang kind of way. They combine to make the number 11 (3 + 11 + 5 – 8 = 11). Malice = 11. These two words share in common the same meaning. Both words can be traced (via dictionary) to the meaning “Ill will.” According to what Ian has discovered, the number pulled from “Ill will” happens to be -22. Put it through his process and we get 11 (the process is too difficult to explain here, but Ian is convinced what he’s found is correct due to its consistency across our entire language). The phrase “get back” (i.e “get back at someone,” a term attached to “revenge” or other ill-will related words) also equates to -22. What about the other meaning of “get back” – the literal meaning which equates to “recover”? Ian has that correlated too. All of this coincides from what is essentially a larger 4th dimension (or higher) range of numbers. After laying out his system to me, Ian said: “I can’t be wrong. There are too many correlations.” He has amassed a notebook comprising hundreds of words and interconnected numbers that all fit together just like this. Ian is upset by the way we use too many words that don’t match with the original code. He plans to publish a dictionary containing all of the correct numerical meanings and connections of our language. Any meanings not supported by the math are simply that – errors in language, nothing that actually has a grasp on reality, or rather, the Oannesian-imbedded “true meaning” as defined by the DNA and RNA fabric of our worded reality. Ian hopes that once humanity finds the true meanings in words, they will find true knowledge. According to his system, truth will concretely be found through math and logic. We can know the true meaning behind the words “universe,” “perception,” “life,” “logic,” etc. He further says his laws will leave no room for people to “deny” or “blur the lines” of reality. 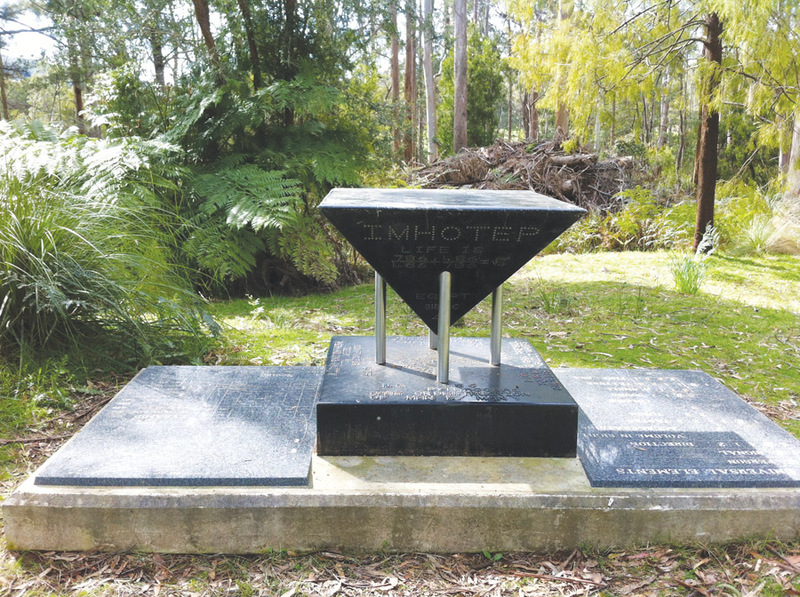 The almost forgotten mysterious monuments laying in an isolated park in northern Tasmania may yet contain a set of keys that unlock hidden truths about our Universe. NOTE TO READERS: You can view all photos, plates & diagrams in this article by obtaining a digital copy of the magazine in which this article appears, New Dawn 139 (July-August 2013). You can visit Sanctuary Park (also known as Sykes Sanctuary) at Railton, Tasmania (see www.sheffieldcradleinfo.com.au/pages/sykes-sanctuary). For more information, contact the Kentish Visitor Information Centre on 61(03) 64911036. This article was published in New Dawn 139.